Prior to saw cutting concrete floor slabs, it’s essential to have as much information as possible in regards to what utilities may be below the surface. In many instances during construction of buildings, conduits & other utilities will be placed in the actual pour of the concrete floor or just beneath the concrete floor. The process will go much smoother if the areas are scanned with ground penetrating radar & radio detection prior to beginning the demolition process. 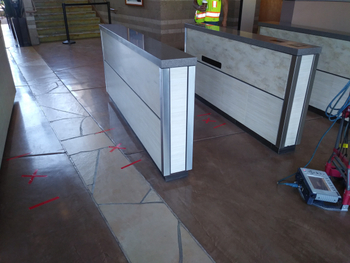 An electrical contractor took a chance with saw cutting an entrance area of the building without having it scanned first for any potential conduits. During the saw cutting they had cut through some electrical conduits that powered parts of the building. Before they continued to saw cut the areas they decided it would be best to investigate the floors for any more surprises. There were many unknowns as to what types & how many utilities were embedded in the concrete floor during the original construction. The building facilities didn’t have any records or drawings of what could possibly be passing through the floors. 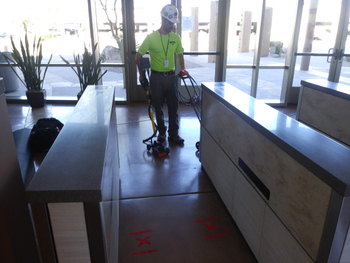 Ground Penetrating Radar Systems of the Phoenix, AZ area was contacted to conduct a GPR investigation of the floor to locate any utilities sub-surface prior to allowing the saw cutting to continue. GPRS was able to scan the different areas with a 1600 MHz high resolution antenna to mark the depths of the conduits passing through the card reading areas. They marked the paths of existing conduits passing through the proposed areas directly on the surface in real time. The conduits were being fed from underneath the desk nearby. The GPRS project manager then walked the site contact through the building explaining everything they had located. It’s important to have everyone on the same page as far as what the markings are indicating. The general contractor was able to continue the project without having to worry about existing utilities being compromised & anyone on the job being hurt. GPRS helps to create a safe working environment for all construction personnel on-site. The next time you need ground penetrating radar at your site in Arizona, contact Senior Project Manager, Thaddeus Bullock at (480) 540-6092 or thaddeus.bullock@gprsinc.com. To schedule a Lunch & Learn presentation, please contact Thaddeus Bullock for further details.